Tewantin, a town, is 120 km north of central Brisbane and about 4 km inland from Noosa Heads. It is thought that the name was derived from an Aboriginal word describing dead trees or logs, possibly a reference to timber brought down the Noosa River to a wharf at Tewantin in the 1860s, just west of the present bridge over Doonella Lake. Tewantin was first settled by Europeans permanently in 1870 and in 1871 a township surveyed. Early industry revolved around timber getting and milling, the steamer Culgoa plying the coast to Brisbane delivering timber, fish and oysters. Tewantin township was surveyed in the vicinity of the timber wharf, which was approached by a midden of oyster shells across the beach. There were also a hotel and a post office, and some buildings were built from logs washed up from a cargo of timber that had been abandoned. Tewantin was a busy port, not only for timber transport but for passengers who preferred steamer voyage and coach connection to Gympie over the inland track from Brisbane to the goldfields town. Fish and oysters were also dispatched to Brisbane. The opening of the railway from Brisbane to Gympie in 1889 reduced boat passenger numbers, but by then Tewantin's Royal Mail Hotel had become established as a holiday destination for Gympie's inhabitants. The establishment of a viable alternative transport route other than sea was perhaps fortuitous, for in 1891 the Culgoa came to grief on the Noosa Bar. 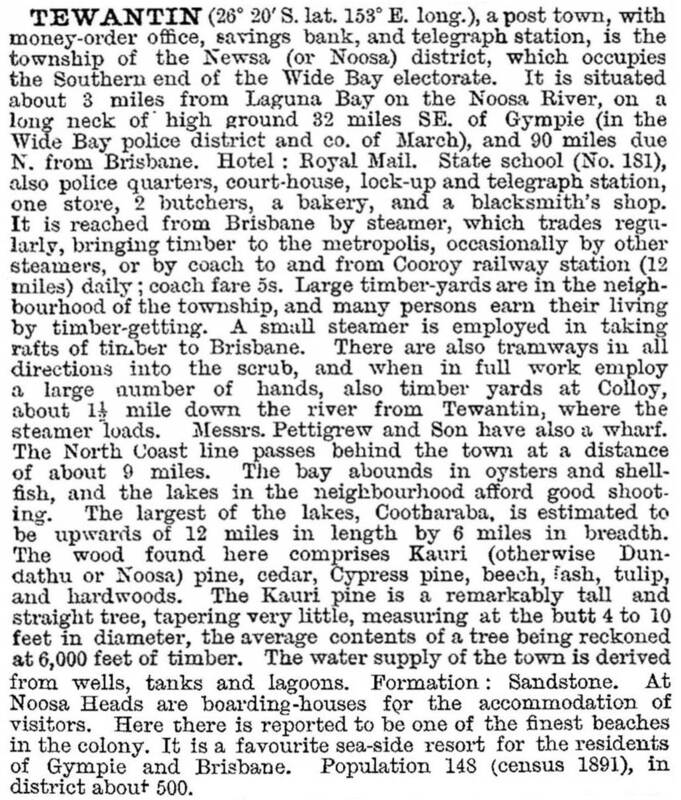 Tewantin, however, was in need of economic diversification as timber resources were depleted and the mills and wharves fell into disuse. A degree of salvation came through tourism. Before the development of Noosa Heads, Tewantin was the "Honeymooners' Paradise" and the centre of a 'Lakes District', a reference to Lakes Cootharata, Cooroibah and Como along the Noosa River, and Lakes Doonella and Weyba off Noosa Inlet. They provided a nature's wonderland. Penrod's Guide (1957) indicated that Tewantin (with a population then of about 1800 people) offered rowboats and motor dinghies for hire and fishing, golf links, bowls, tennis, picture theatre, dance hall, shops, garages and cafes. Accommodation was available at the hotel, guesthouses, flats, houses to let and the caravan park. Visitors to Tewantin could cross to Noosaville on the Doonella Bridge (1929). Within ten years of Penrod's account the tourist focus had shifted from Tewantin to Noosa Heads, particularly with the opening of the coast road. Developers seeking to emulate the successful Gold Coast canal estate developments were attracted to the Noosa area in the 1970s, spotting the potential presented by Hays Island (Noosa Sound). Tewantin's subsequent growth tended to be as a dormitory suburb to the tourism industry at Noosa: by 2001 only 5% of Tewantin's census count was non-resident, whereas 30% of Noosa's was non-resident, ie holiday makers. Tewantin has three churches, three aged persons' residential facilities, a golf course, a State primary school (1875), TAFE (2004), sports complex and the offices of the former Noosa Council, relocated from Pomona in 1980 to the site of the former Tewantin caravan park. There are state forests to its west and south.